Tell Me a Story: I've Been Away Too Long! Hard to believe that my last post was at the beginning of June and it's now well into August. Shortly after that post I had a most undignified fall from a stool while cleaning windows and sprained the fingers of my right hand - no computer work for several weeks! Then it was time for our much-looked- forward-to holiday - a wonderful trip from which we returned on Friday. Since then the top priority has been sleep and in my semi-lucid moments slowly getting through the posts in my reader. I'm glad I signed up for Feedly as well as Bloglovin because it gives the option of reading the whole post. It was tempting to simply mark all as read but then I might have missed something important. What shall I read? is the next question but a visit to the library this afternoon should help solve that one. Meanwhile I'm reading a book my brother lent me after a conversation about Three Men in a Boat. 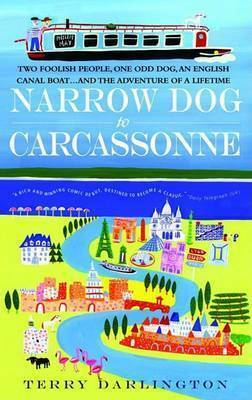 Narrow Dog to Carcassonne by Terry Darlington is the story of retired English couple, Terry & Monica, and their whippet named Jim, who decide to take their canal narrowboat across France and down to the Mediterranean. Sharing their adventures is the perfect way to ease gently back into our normal quiet life and it's very, very funny. I'm looking forward to getting back to blogging but plan to take it easy - no pressures about reviewing and resigning myself to the fact that I'm unlikely to finish any challenges this year. Welcome back! It does seem like a long time, and it's good to have you posting again. I hope to hear more about your trip, and possibly some bookstores along the way? Thanks, Lisa ......plenty of bookstores and charity shops but sadly not with shelves laden with Viragos as I'd wished for. I hope to share some highlights of our trip in the coming weeks. It's good to see you again - welcome back! Good to be back, JoAnn.